Researchers led by NASA’s former chief technologist are hoping to launch a satellite carrying water as the source of its fuel. The team from Cornell University , guided by Mason Peck, want their device to become the first shoebox-sized “CubeSat” to orbit the moon, while demonstrating the potential of water as a source of spacecraft fuel. It’s a safe, stable substance that’s relatively common even in space, but could also find greater use here on Earth as we search for alternatives to fossil fuels. Until we develop a warp drive or some other futuristic propulsion system, space travel is likely to rely largely on the kind of propellant-based rockets we use today. These work by firing gas out of the rear of the vehicle in a way that, thanks to the laws of physics , pushes it forward. Such propulsion systems for satellites need to be lightweight and carry a lot of energy in a small space (high energy density) in order to continuously pack a powerful punch over the many years, or even decades, that the craft are in orbit. Safety too is of prime concern. Packing energy into a small volume and mass in the form of a fuel means even the slightest issue can have disastrous consequences, as we saw with the recent SpaceX rocket explosion . Putting satellites in orbit with any form of unstable fuel on board could spell disaster for expensive hardware or even worse, human life. Water is a way around this issue because it is essentially an energy carrier rather than a fuel. The Cornell team isn’t planning to use water itself as a propellant but to rather use electricity from solar panels to split the water into hydrogen and oxygen and use them as the fuel. The two gasses, when recombined and ignited will burn or explode, giving out the energy that they took in during the splitting process. This combustion of gasses can be used to drive the satellite forward, gaining speed or altering its position in orbit of whichever desired planet or moon is the target. Electrolysis has been use in space before to provide oxygen supplies for manned space missions without the need for high-pressure oxygen storage tanks, for example on the International Space Station . But instead of sending water into space in heavy loads on rockets, we could also one day extract it from the moon or asteroids . If the novel approach of using both the hydrogen and oxygen for satellite fuel proves successful, we could have a ready source of it waiting for us in space. 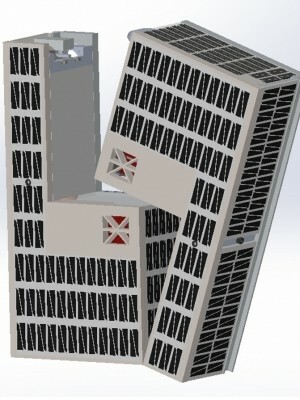 This means it could shape how we power at least some of the spacecraft of the future. As is often the case, developments in space technology are pushing concepts that have the potential to help overcome significant energy problems here on Earth. Electricity is really difficult to store and, as we increase our renewable energy supplies, we need to buffer the supply and demand . Wind and solar farms are really inefficient forms of renewable energy, not because of problems with the generating technology but because we often cannot do anything useful with the energy that they produce. The electricity grid struggles at times of high production and low energy need. Welsh start-up firm Riversimple – along with major car manufacturers Toyota and Volkswagen – is already producing hydrogen fuel-cell cars. So if the hydrogen is produced from solar energy in the same manner as Cornell’s satellite, this space technology could become part of your everyday life sooner than you think.